Quest of the Demon - two Reviews, two 4/5 ratings! Thank you to Jasmine and Marissa for their time. These two lovely bloggers are from Beneath the Moon and Stars and both of them thought it would be a good idea to see what my first was all about. For Jasmine - "This book was a perfect change for me. I haven't read a fantasy in forever." I'm lucky she took a chance on reading Quest of the Demon (which is nothing but fantasy) because she finished her review with the following; "Overall I loved this. I've heard rumors about a sequel and I'm hoping there is one. I highly recommend this :). 4/5 Stars"
As if that didn't make me happy enough. Her co-blogger, Marissa also had some lovely things to say "Overall I really enjoyed this book there was dragons and ships and magic and it was awesome. 4/5 stars." "So, so good!" - Stephanie from the book addict. Thank you for your time and encouragement. I'm chuffed to say the least. Tallen's first industry review - 4/5 stars. "I just want to say that Ms.Sawyers writing has improved since her first novel! If your looking for a fun and adventurous read this is your calling...."
Awsome day. Quest of the Demon reviewed by a real New Yorker! "Adventure, romance, fantasy, creativity, and mystery surround this tale. It is a never ending ball of excitement" - Marybeth, Manhattan Reader. All the way on the other side of the world a review for Quest of the Demon. Thanks Marybeth for your time. It has made for a very good end to my day! I would like to thank Steph for her time and for reading Quest of the Demon. It's always exciting to get such reactions and as an author it really makes me smile! A big thank you to Haley from Been There Read That who has posted not only a lovely review, but a video review as well. Click on the link above to see it all. "Overall, I really enjoyed this book. This is kind of random, but I thought the map at the beginning was kind of cool." - Halye. How awesome is that? I drew that map (and Neil from Equilibrium books made it more printable) but still. "Overall I thought the book was pretty good. Some parts kind of drug on especially the parts leading up to the battles. I liked the relationship between Darci and Taslessian, and I'm interested in how it will progress. 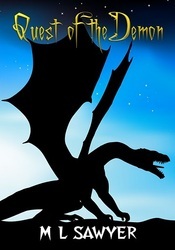 If you are looking for a fantasy novel with interesting characters and quite a bit of action you have found your book. I rate this 3 out of 5 stars!" I heard of this through the sffworld website that I frequent so thought I’d give it a go. I’m not normally in to reading short stories but I have to say that I found this entertaining. The stories were short enough to fill in time where I had not much to spare, entertaining enough for me to read the lot in two days and unique enough for me to recommend it to others. "Quest of the Demon is a fast-paced, action-packed epic fantasy novel with a well-developed plotline and original characters." - Majanka Verstraete. Belgium Blogger Majanka Verstraete has been kind enough to not only review Quest of the Demon (4/5 stars) but she has also given me my first official interview! Check out her very detailed blog I Heart Reading!